There are a multiple methods to deploy the Cumulative Updates (CU) of ConfigMgr, to all the different components (console, client and server). The most common used method is the old-school packages that are created during the upgrade of a site server. This blog post will be about another less often, but definitely not less effective, method of deploying a CU is via System Center Updates Publisher (SCUP). In this post I will go through the steps required to deliver a CU, via SCUP, to ConfigMgr as a software update. 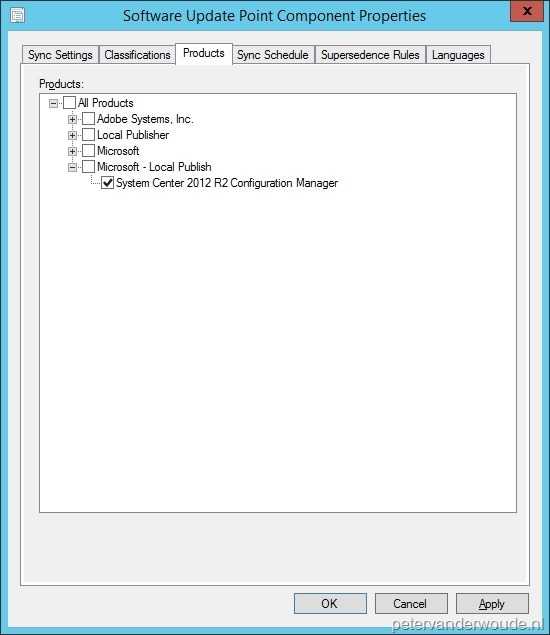 1 Open the System Center Updates Publisher 2011 Console, navigate to the Updates workspace and select Import in the Home tab. 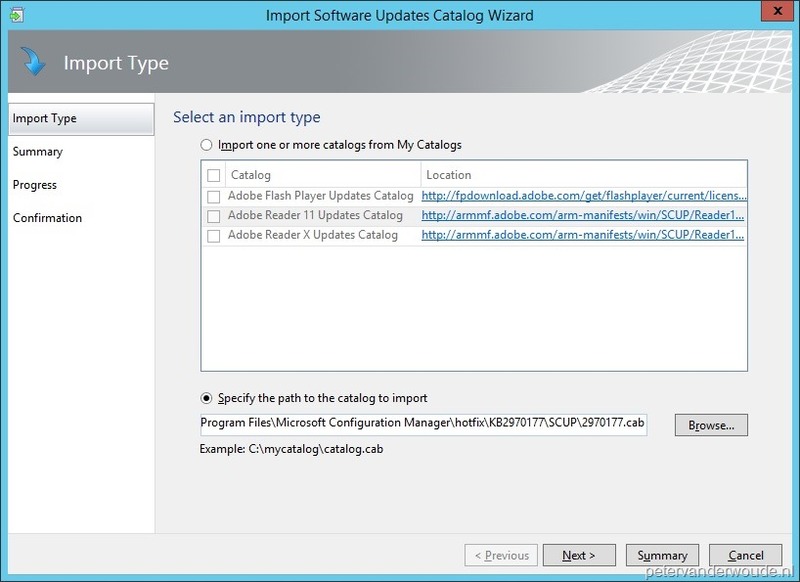 2 On the Import Type page, select Specify the path to the catalog to import, Browse to the CAB file and click Next. 3 On the Summary page. click Next. 4 On the Security Warning popup, click Accept. 5 On the Confirmation page, click Close. 6 To verify a successful import, either check the SCUP.log (located in the AppData of the user performing the action), or check the Updates node in the SCUP console that should now show the following updates. 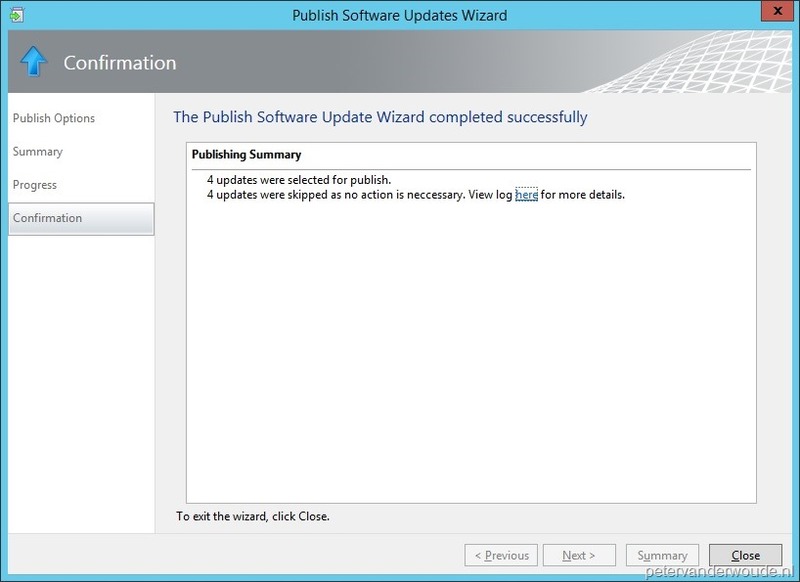 1 Open the System Center Updates Publisher 2011 Console, navigate to the Updates workspace, select the new updates and select Publish in the Home tab. 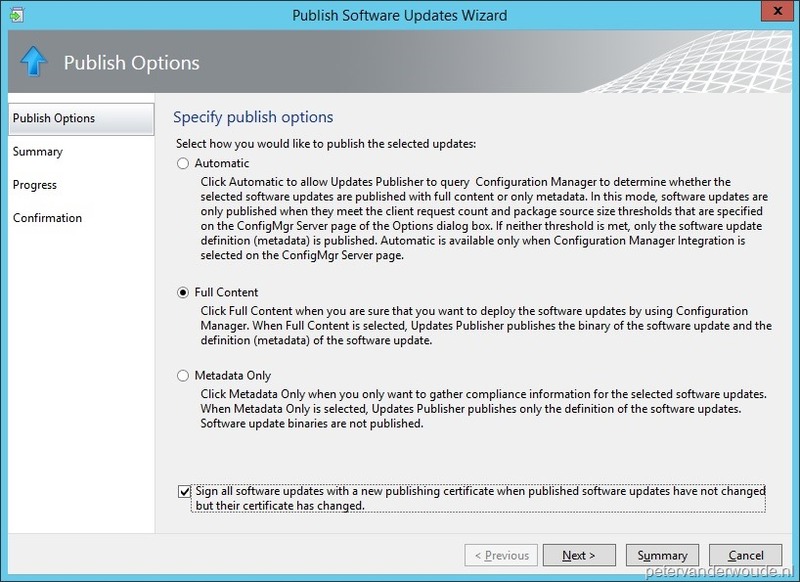 2 On the Publish Options page, select Full Content, select Sign all software updates with a new publishing certificate when published software updates have not changed but their certificate has changed and click Next. 3 On the Summary page, click Next. 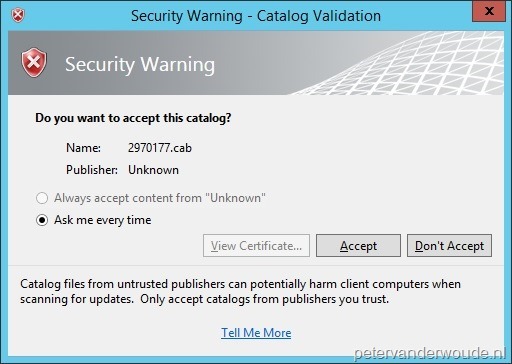 4 On the Security Warning popup, select Always accept content from “Microsoft Corporation” and click Accept. 6 To verify a successful publish, either check the SCUP.log (located in the AppData of the user performing the action), or check the Updates node in the SCUP console that should now show a Date Published. 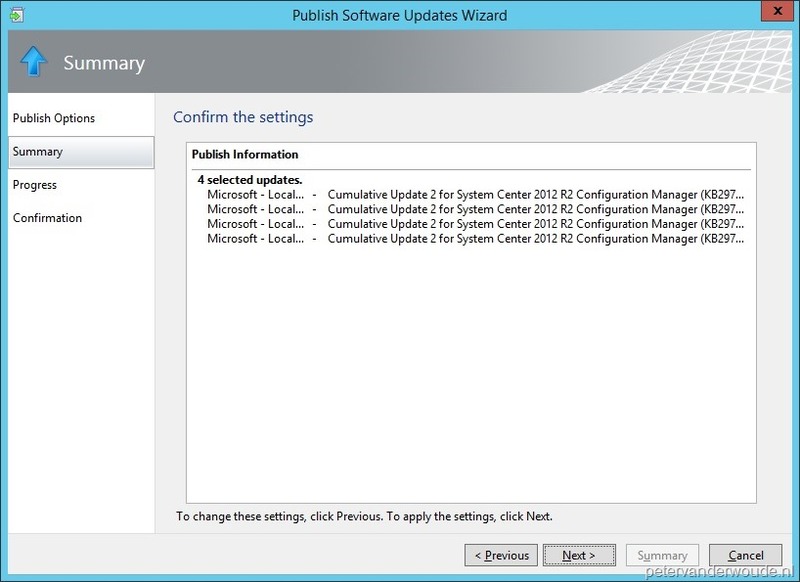 1 Open the System Center 2012 R2 Configuration Manager Console, navigate to Software Updates > All Software Updates in the Software Library workspace and select Synchronize Software Updates in the Home tab. 2 After the synchronization is done, navigate to Site Configuration > Sites in the Administration workspace and select Configure Site Components > Software Update Point. 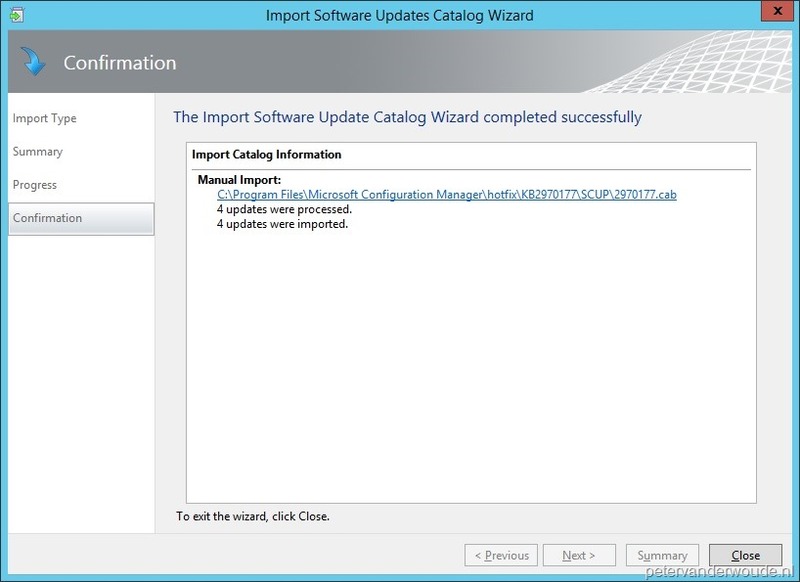 In the Software Update Point Component Properties, in the Products tab select System Center 2012 R2 Configuration Manager (located under All Products > Microsoft – Local Publish) and click Ok.
3 Navigate back to Software Updates > All Software Updates in the Software Library workspace and select Synchronize Software Updates in the Home tab. 4 To verify a successful synchronization check the wsyncmgr.log. At the end it’s always nice to look at the results. 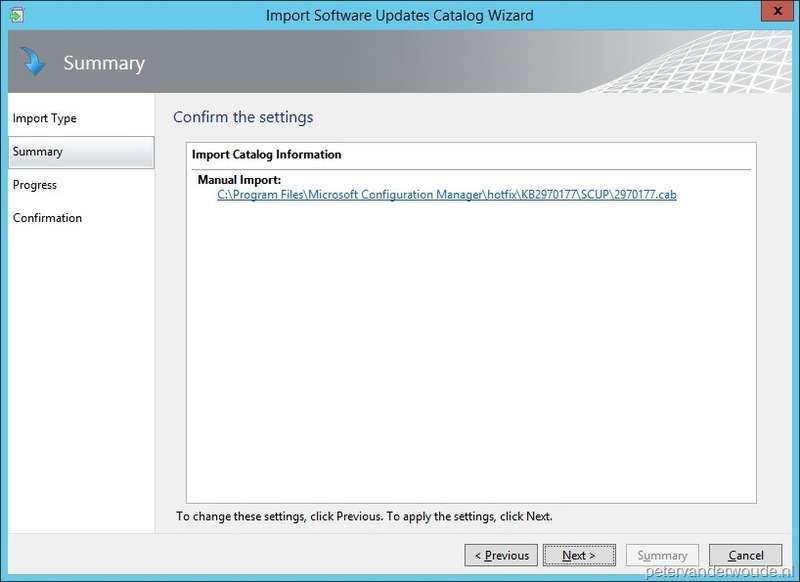 Navigate to Software Updates > All Software Updates in the Software Library workspace and in the product filter it’s now possible to select the product System Center 2012 R2 Configuration Manager. By doing this the console will show the newly synchronized updates. After this the CU can be deployed as any other normal (security) update. This is an excellent way of updating clients. We use this method always. True. I also really like it this way. Thanks Peter! Yeah, I often find myself on your site for information :). I switched over to TechNet from my old setupconfigmgr.com blog since onboarding with MS.
Have a possible issue we have installed SCUP a while back on our CM2012 platform which is dealing with our Corp domain and clients all works well 🙂 the issue I that we have a 2nd domain that we currently have a mp,dp,sup located in the 2nd domain that we are able to deploy the normal stuff through but we also need to get SCUP deployments through the question is will the Cert from the Corp domain work in the 2nd domain. That all depends on the certificate that you are using and if it’s trusted or not.